After a four-goal performance on Monday – the first of his NHL career – John Tavares is now five goals away from the illustrious 50-goal club. With 45 goals, he has five games to become the first Toronto Maple Leaf to reach the marker in 25 years. The 2009 first overall draft pick has blown past his personal best of 38 goals in a season. He now trails only Washington Capitals sniper Alex Ovechkin for the league lead in goals. Tavares has also tied his career high with 86 points. 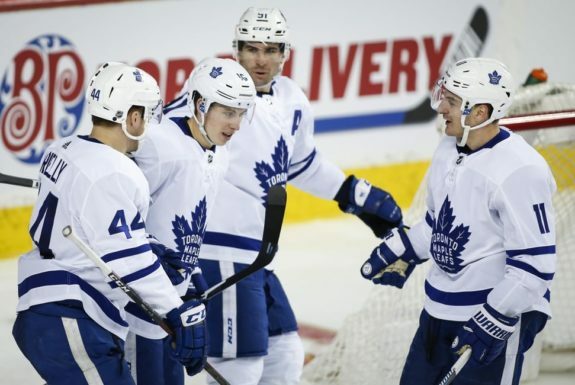 The Leafs’ one-two punch at center with of Auston Matthews and Tavares has given coach Mike Babcock a lethal dose of offense to roll. Opposing teams can only hope to contain one of them. Breaking down his season, Tavares has 23 goals in 39 home games and 22 goals in 38 road games. He had 30 goals in 49 before the All-Star break and 27 goals in 16 games after it. Sat., Mar. 30 at the Ottawa Senators – in three games against the Senators this season, Tavares has two goals and two assists. Mon., April 1 at the New York Islanders – in two games against the Isles this season, Tavares failed to record a point. 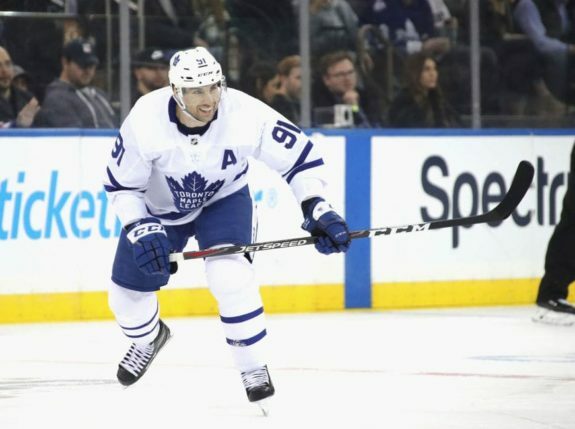 Tues., April 2 against the Carolina Hurricanes – in two games against the Hurricanes this season, Tavares has two goals. He’s scored 22 goals in his career against the Canes, his most against any team. Thurs., April 4 against the Tampa Bay Lightning – in three games against the Lightning this season, Tavares has only two assists. Sat., April 6 at the Montreal Canadiens – in three games against the Habs this season, Tavares has two goals and two assists. As a child, Tavares slept in Maple Leaf pajamas and dreamt of success. Now, with two weeks to go in the regular season, he has had a Top 10 season in goals and a Top 25 campaign in points in franchise history. Before joining the NHL in 2006-07, Tavares had a whopping 72-goal season in 67 games with the Oshawa Generals of the OHL. 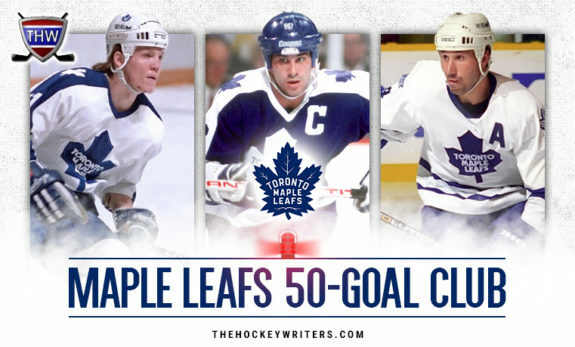 The last Maple Leaf to reach the lofty 50-goal plateau was Hall-of-Famer Dave Andreychuk in the 1993-94 season. He did so after scoring 29 goals for the Buffalo Sabres before joining the Leafs. Rick Vaive hit the mark three times, while Gary Leeman achieved it once. Of these three players, only Andreychuck was able to propel his team beyond the first round of the playoffs. As the season winds down and the Maple Leafs are on their way to the playoffs, there’s a lot of excitement ahead. While Babcock is regimented and stresses team success above all else, he can’t help but pay attention as Tavares and others chase personal milestones. Rielly, Travis Hyman, Marner and Matthews are all bound for career seasons. Only five players have scored 50 goals in a season since Tavares entered the league in 2009: Alex Ovechkin, Steven Stamkos, Sidney Crosby, Evgeni Malkin and Corey Perry. Whether or not Tavares adds his name to the list, it sure feels like the last few weeks of the season will be the start of a wild postseason ride.